If you are looking for affordable OTR Tires for Leeboy Motor Grader, we have them here at Monster Tires! If you are looking for dependable Off the Road Tires for Leeboy Motor Grader, we don’t sell anything but dependable tires! Here at Monster Tires, we know that the safety of your worksite and your workers depends on your heavy equipment having the best tires. Whether you are looking for a Rear Tire Set for Leeboy Motor Grader, a Front Tire Set for Leeboy Motor Grader Tires, or a Set of four tires for Leeboy Motor Grader Tires, you will find it here. 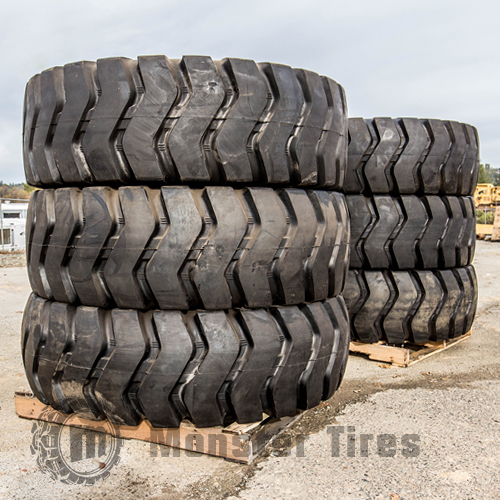 We have the tires you need for your 785 Motor Grader, 685 Motor Grader, or 635 Motor Grader. When you shop for Tires for Leeboy Motor Grader, it is easy to make your decision based on price. Unfortunately, cheap Construction Tread Tires for Leeboy Motor Grader tend to wear out very quickly, leaving you having to spend even more money to replace them again. Get the high quality tires and they will more than make up for the difference in price by lasting so much longer and working so much harder. And at Monster Tires our Tire Package for Leeboy Motor Grader is so affordable anyway, you practically can’t afford not to! Trust in Monster Tires for your next set of Leeboy Motor Grader Tires.